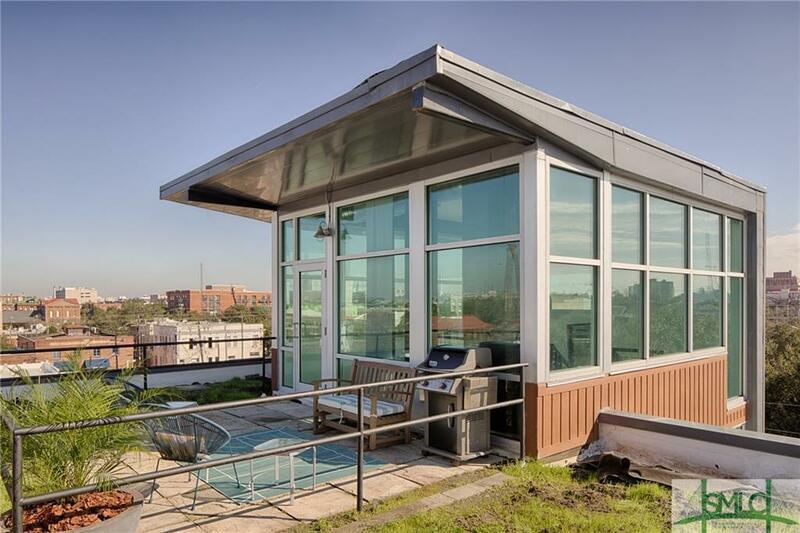 Unique Penthouse Loft w/Panoramic Views & Impressive Rooftop Deck in the Landmark District @FrogTown. (+-1518 SqFt) Leeds Cert./Sustainable. Enjoy this one of a kind 2 bed/2 ba loft w/floor to ceiling windows, impressive glass room w/2 story high ceiling, floating loft leading to private roof deck perfect for watching sunrises, sunsets or fireworks while entertaining or relaxing. The kitchen is equipped w/high end appliances, custom cabinets & an over sized granite island. The exterior walls of the structure are constructed using precast structural concrete panels w/a layer of rigid insulation between 2 layers of high-density concrete. This provides a high level of insulation. The energy-efficient aluminum storefront windows maintain a high level of insulation while allowing daylight to flood the interior spaces. Unparalleled views of Savannahs Citysearch. Take exterior stairs or elevator to your floor. Off St. Pkg. Near great restaurants & fun bars & I-16. Click Reel-3d video.